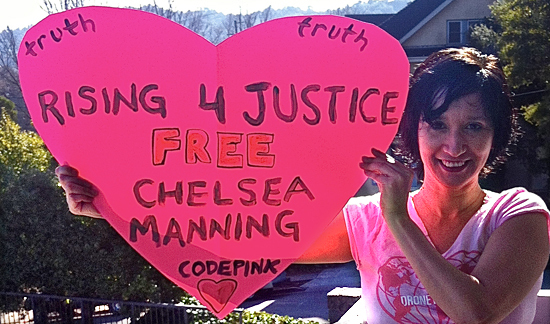 CODEPINK : One Billion Rising For Justice! I Heart the Truth! One Billion Rising For Justice! I Heart the Truth! This year, CODEPINK is joining V-Day in its One Billion Rising For Justice campaign! I Heart The Truth addresses the need to RISE for JUSTICE for incarcerated and exiled whistle-blowers who have exposed the truth. Whether it's releasing the Iraq war logs or documents on NSA domestic spying, the whistle-blowers seeking corporate and government transparency have endured severe consequences. Tell us about your favorite whistle-blower that you will be RISING for on February 14! Three things you can do to I Heart The Truth on February 14! Write a Whistle-blower! Host a letter-writing potluck, picnic or party to recognize a whistle-blower and celebrate truth and justice on their behalf . It’s an unfortunate reality that today whistle-blowers seeking justice are incarcerated or exiled. The burdens this places on our social system and affected families are both financial and emotional. The damages this causes affect our society, our communities and the affected families. Find out how to write a letter to Chelsea Manning, Edward Snowden, John Kiriakou or Jeremy Hammond. Submit an I Heart the Truth photo on Tumblr & send a copy to a whistle-blower! Join a One Billion Rising For Justice event in your community and take the message of I Heart the Truth!